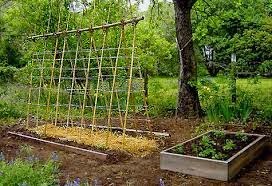 Come monsoon and all farmers whether urban rooftop or large scale feel the need of trellises. Almost all our monsoon veggies i.e. Doodhi, Karela, Sponge Gourd, Little Gourd, Ridge Gourd need trellises. So do our beautiful ornamental flowers. Our community farm at Don Bosco Matunga also needs these for our growing farm. So join us to make trellises, entrance archways, supports, hangers etc...on Saturday and Sunday 26th & 27th July morning 8 am to 1.00 pm. The event promises to be exciting, fun filled learning activity for teenagers, children with their parents, all practicing urban farmers/gardeners.There is some activity for all age groups. Tushar Kelkar, who practices eco- friendly architecture, will be here with us these two days to guide us build them. INTERESTED PARTICIPANTS CAN ATTEND BOTH DAYS OR ONE DAY IF IT IS NOT POSSIBLE TO ATTEND BOTH DAYS. For confirmation of registration, please remit your contribution before 25TH JULY 2014. Please carry some snacks/tiffin if required as food will not be served at this workshop. Umbrellas will prohibit you from working in case it rains so please carry appropriate rain wear which will allow you to work. Images of participants may be used by Urban Leaves on our website and Facebook page to create awareness about city-farming for all ages. REGISTRATION AND PAYMENT DETAILS PLEASE FILL THE FORM AT THE LINK GIVEN BELOW TO REGISTER FOR THE WORKSHOP. Please ensure that you fill in your PROPER EMAIL ADDRESS as further communication from us will be sent to this address. USING BAMBOO IN URBAN FARMS WORKSHOP REGISTRATION FORM Payment can be made via Bank Transfer/NEFT, Cheque/Cash Deposit in Bank, Cash payment to a volunteer or Cheque couriered to us. We recommend this mode as it is the quickest and requires the least effort. It can be executed through net-banking or through your bank branch. Please use the link given below to locate a branch in Mumbai/Thane. Please write the Participant's name (in case the cheque is sent by someone else), registration number and contact number on the back of the cheque and please do mention "URBAN LEAVES: WORKSHOP ON USING BAMBOO IN URBAN FARMS" on the envelope.